Everton capitulated and collapsed on Sunday afternoon as a Southampton side that failed to register one shot on target at Anfield last week strolled to a comfortable and totally dominant victory. Still in search of a win away from Goodison since January, Everton arrived at St.Mary’s in desperate need of not only three points, but a massively improved performance following Thursday’s drubbing by Atalanta. Argentine Mauricio Pellegrino in charge of Southampton, themselves having a poor start to the season and only a point ahead of the Blues prior to kick-off, selected a starting eleven in a 4-2-3-1 formation of: Forster, Soares, van Dijk, Hoedt, Bertrand, Hojbjerg, Davis (c), Tadic, Ward-Prowse, Boufal and Austin. With rumours swirling around like an out of control tornado as to who is on an alleged shortlist to become the new Everton manager, still in interim charge David Unsworth was unable to include leading scorer Oumar Niasse and suspended Tom Davies so he too opted for a 4-2-3-1 made up of: Pickford, Baines, Keane, Jagielka (c), Kenny, Gueye, Schneiderlin, Lennon, Sigurdsson, Mirallas and Calvert-Lewin. With cards, watches, whistles and free kick marker foam was referee Kevin Friend. A quiet opening to the game almost saw the home side take a fourth minute lead as a free-kick from Ward-Prowse hit Jagielka in the stomach and thankfully fell nicely for Pickford to gather before Austin could react. Southampton were enjoying more of the play and Everton survived a scare when Soares found Austin and his shot hit the post and rebounded to safety. The Blues spurned a great chance just past the quarter hour mark as Mirallas worked his way into the box only to miskick, and Southampton promptly punished them with a quick counter attack that saw a great ball played in off the left flank by Bertrand for Tadic to take one touch to get ahead of Jagielka and then steer past the onrushing Pickford. 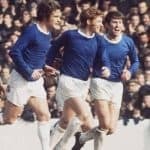 It had turned into a good start for the home side as Everton looked nervous and woefully short of confidence and ideas, and when Baines pulled up and hobbled off, things looked to go from bad to worse. Ashley Williams duly replaced Baines on 27 minutes and the back four was re-arranged to read from right to left, Kenny, Williams, Keane and Jagielka at right back. DCL put pressure on Cedric to win a corner on the half hour but Sigurdsson could only find the grateful arms of Forster. Austin won a midfield ball to release Tadic against Williams with the Saints player winning that race with ease before crossing against Keane and appealing stupidly for a penalty. Even when van Dijk got forward and lost possession, Everton couldn’t make the most as the ball forward from DCL aimed towards Mirallas was easily picked off and the momentary threat was lost. Two quick Ward-Prowse corners again caused problems for Everton, the second seeing van Dijk have a clear, unchallenged header that thankfully went wide of the target. Incredibly after such a dismal first 45 minutes, Everton drew level as DCL fed Sigurdsson and he worked himself an opening for a curling right foot shot that hit the crossbar, post, bounced back onto the crossbar again before eventually settling into the opposite corner for the most unlikely equaliser of the season. The boost of the equaliser on half time was rather too quickly wasted as Southampton took barely seven minutes to regain the lead. Mirallas lost possession in midfield and the counter saw as a left wing cross from Bertrand headed home powerfully by Austin. Five minutes later and Austin added his second and Southampton’s third marker as Tadic, largely untroubled, reached a ball by the left wing corner flag and his peach of a cross found Austin inside the six yard box again unchallenged to convert the easy header. With over half an hour still to play, Southampton were now buoyant and looking to add to their tally against the defence that has now conceded the most goals in this Premier League campaign. Ademola Lookman replaced Mirallas on 63 minutes to try and add some pace and spark to an Everton performance that, the Sigurdsson strike apart, had been quite frankly shocking. Saints were now picking Everton off at will as the Blues struggled to maintain any possession and another Ward-Prowse corner from the right found Hoedt unmarked in the area and once again, Everton had to be grateful for another effort off target. At a pause while Keane received some treatment for a knock before limping off to be replaced by Nikola Vlasic, it was noticeable that Jonjoe Kenny was the only player in blue attempting to gee his team mates up and imploring them to a greater effort for the final quarter hour. Lemina replaced Tadic for the home side and a few minutes later the home fans gave Austin a standing ovation as he was replaced by Shane Long. A terrible effort at a backpass by Jagielka was pounced upon by Long and it was only the smart action of Jordan Pickford that prevented the scoreboard moving again. Saints made their final change on 86 minutes replacing Boufal with Yoshida and two minutes later, this latest debacle officially became a disaster as the Everton defence fell apart to allow Saints captain Davis to run onto a pass from Ward-Prowse to side foot home the fourth from outside the area. Let there be absolutely no mistake, this Everton squad is most definitely in a relegation fight now and it looks bereft of the ingredients needed to survive. And of the players who wore the blue jersey today, only Kenny and maybe Lennon are worthy of a vote for Man of the Match – the rest including goal scorer Sigurdsson who gave us fleeting hope were pathetic. If as many people now suspect and indeed believe that the clubs inability to appoint a new manager is due to massive differences in outlook and opinions between the chairman, board of directors and the major shareholder Farhad Moshiri, God help us.